The Sony HDR-MV1 Music Video Recorder is designed for capturing high-quality video and audio. It can record Full HD 1920 x 1080p video at 30 fps and LPCM or AAC stereo audio. For video, it's equipped with a 16MP Exmor R CMOS image sensor and a wide-angle 120° Carl Zeiss Vario-Tessar lens. It can also capture HD 1280 x 720p video at 30 fps and it records to the web-friendly MP4 format. The camcorder features a 2.7" LCD monitor as well. For recording audio, the HDR-MV1 features a 120° stereo microphone array and an external microphone input. It also has a headphone jack for more accurate audio monitoring. You can record audio using the 44.1kHz/16-bit LPCM format or the 48kHz/128kbps AAC format. Plus, the camcorder supports Audio Lip Sync functionality and manual or auto audio level control. The 2.7" LCD screen features an on-screen meter as well, which you can use to monitor the audio input levels. For wireless connectivity, the HDR-MV1 features built-in Wi-Fi with One Touch NFC smartphone or tablet pairing. This allows you to use your compatible mobile device as a remote control and a remote monitor. Once you've recorded some footage, you can transfer it to your mobile device via Wi-Fi for immediate uploading onto the Internet. There's also a micro-HDMI output and a Multi Terminal USB port that supports simultaneous data transfer and charging. Records in uncompressed Linear PCM (LPCM) and versatile AAC audio formats. With LPCM recording you'll be able to capture high-resolution CD-quality 44.1kHz/16-bit sound. With AAC recording you'll be able to capture 48kHz/128kbps audio files for easy uploading to the Internet. The HDR-MV1's 120° stereo microphone array captures full stereo sound. Plus, unlike smartphones and conventional camcorders, its wide-angle recording field allows you to easily capture every note and lyric from the entire band - even at close distances. Record Full HD 1920 x 1080p video at 30 fps with low grain - even in low lighting situations. You can record using the web-friendly MP4 format, which is ideal for sharing your Full HD movies on the Internet using your smartphone, PC or Mac computer. Experience enhanced low-light sensitivity with improved image clarity and reduced grain thanks to Sony's back-illuminated Exmor R CMOS image sensor. Designed for compact cameras and camcorders, the Exmor R CMOS sensor relocates the photo diodes above the support circuitry, maximizing the light gathering area per pixel so you can shoot with better results in lower lighting conditions. The camcorder also features a BIONZ image processor and Triluminous color technology. The 120° wide-angle Carl Zeiss Vario-Tessar lens captures high-quality video with Full HD 1080p or HD 720p resolution, high contrast and accurate color reproduction. Plus, its wide viewing angle allows you to easily capture the entire band and stage from close distances. The unit's integrated Multi Terminal USB port provides convenient charging and data transfer connectivity. The HDR-MV1's USB port will even charge the battery and access content on a computer simultaneously. Plus, with the supplied battery and optional AC-UD10 power adapter, users can operate and record video while the device is charging. You can use your favorite microphone when recording by simply attaching it using the camera's microphone input jack. The HDR-MV1's 2.7" widescreen LCD monitor allows users to quickly frame their shots and make adjustments. You can use the LCD screen to manually or automatically adjust audio level control in 31 steps. There's also an on-screen meter that allows users to monitor the audio input levels and adjust to diverse environments. The HDR-MV1 employs built-in Wi-Fi and One Touch NFC (Near Field Communication) to link the camera to a compatible smartphone or tablet. This allows you to instantly upload recorded videos to the Internet. The Wi-Fi/NFC function also turns your mobile device into a remote control and a remote monitor for the HDR-MV1, which is especially useful for framing the scene to achieve your desired shot. Box Dimensions (LxWxH) 5.7 x 4.5 x 2.9"
HDR-MV1 Music Video Recorder is rated 4.0 out of 5 by 9. Rated 3 out of 5 by Dr Ted from Nice build & audio, Video disappoints Sony builds great hardware, and the features of this unit are good (manual or auto levels, etc). Battery life is good. Close to 2 hours depending on battery. But I was hoping for better video. Canon Vixia mini video significantly better but is auto gain only, and the Vixia has very poor battery life...hardly one half hour. GoPro battery 2+ hours (especially with battery pack) and video great, but audio poor. Zoom Q2HD has best audio, but the worst video in class. So I was hoping Sony would give me everything, but the video is much grainier in low life that the Canon or GoPro, and there is so much blurring at the edges of the video, to make it almost un-usable. Rated 3 out of 5 by John T from Some problems Three stars because it does what it says quite well for the price. But be careful: If the battery runs out while recording the file becomes corrupt and can't be played back. After putting in a fresh battery, the camera asks if you want to repair the file. Choose OK and it appears to be fixed. Then file doesn't show up in camera menu. When hooked up to computer, file reappears in the folder but won't play. This happened to me TWICE in a week. Had it on a stand as an extra cam, to set and forget. Fresh battery died in 70 min and the file could not be played. Didn't jeopardize the shoot because I brought it mainly for stage audio, and I also recorded from the board onto my mac. I suppose an external power supply would solve the problem. Rated 4 out of 5 by Anonymous from audio with a video follow I bought this camera for a very specific purpose. As an audio recorder that also recorded video. I am primarly using this camera for recording interviews so I need to be fairly close to have a good dialogue. The camera can sit very close on a magic arm and capture much better audio than my dslr. The DSLR is on a tripod as well at a distance and is a primary visual recorder. The video follow is really helpful when tryig to sync the recordings. The viewfinder is near useless. It does however bluetooth to my android phone and gives me a viewfinder in the palm of my hand. I can monitor the recording with a low profile and not upset my subject. sometimes I generate sound effects and the video follow is helpful for locating sounds. Its much easier to find sounds while watching a picture than listening to garbled digital sound in fast forward. Its a camera a little bit above a cell phone with excellent audio. The extreme wide angle lens smooths out the bumpy camera work and gets most everything in front of the camera. Like I said this is not a camera for camera work. The camera is a functional add to an audio recorder. Enabling one to visually follow along with out much work. The lens is soft and wide. ok for uploading. Great for locating specific audio or reviewing performance. Rated 5 out of 5 by JH from Gets the job done Very satisfactory video, excellent audio, already knew that it did not have zoom, with right placement of camera this did not pose a problem. Rated 4 out of 5 by Bob Sings Lead from Great, and not so good. I am a member of a 40-man barbershop-style chorus and first used this camera to record a holiday show we did with our local lady's (Sweet Adeline) chorus. For this time let's just say it was good we had a back-up camera. This camera was just released to the market this month (Dec, 2013). I am probably one of the first in my community to have one. Sony has not caught up with itself on this product, and instructions with the device, and online, are very poor. I love that I can set up a direct Wifi connection between my smartphone and that camera. I like that I can download the videos to my computer over my home Wifi network. I also like that the camera records to a microSD card (up to 64 GB). However, there was little to no instruction on how to set that all up. I recorded a 2 hour show. I could play the show on the camera. When I hooked up the camera bu USB to my pc, I could see the video files on the card. But, when I set up PlayMemories and tried to sync the video to my pc, the files disappeared from the card and the pc. It looks like the card was re-formatted (it had already been formatted) and all the data lost. I will try that again when I haven't anything of value in the camera. The only other complaint, that I quickly realized, was it doesn't zoom. Maybe it will be able to digital zoom on my computer. I hope so. Rated 4 out of 5 by jadedmonkeyeyes from good camera Great audio. Good video. Good for band rehearsals and concerts. Rated 5 out of 5 by Robert from GGGGGGreat!! Every musician or music ensemble needs this to be able to record and review each performance. It is unobtrusive and easy to set up. The sound is more than adequate. Critical self analysis always leads to improved performance. The results look and sound great on an HDTV with Bose sound system and are more than adequate for Youtube. 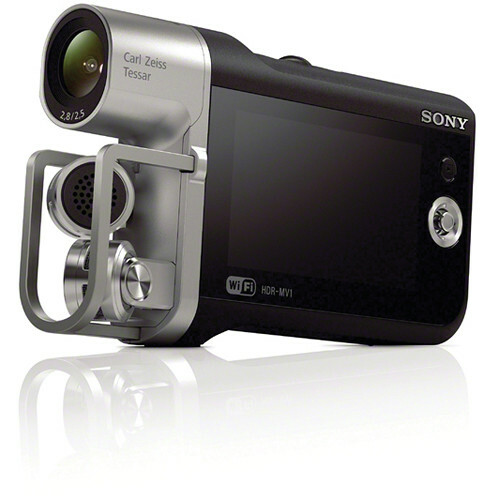 The Sony HDR-MV1 has stereo microphones and an audio input jack. Does it record two separate channels from the two built in microphones? Does it record two separate channels from the audio input jack? Audio is recorded to two separate Left/Right stereo tracks. How can i download remote control for HDR mv1 ? Does this camera have a focus control or is it a fixed focus lens? It's a fixed focus lens. But you can import your video into a program like Camtasia, and then zoom in with that program. Hi there, can I connect a Lav Mic to this camera? Sure can. The camera offers a 1/8 (3.5mm)microphone input. I plan to use it mainly as an audio recorder for lectures and classes. When possible (not all professors allow it), I will record lectures and classes in video too, reason why I'm wondering if the Sony HDR-MV1 can be a good solution for me. My questions are:1. Is there a setting for audio only recordings? 2. If so, is there any estimation on how much time a solely audio recording can last with one battery?3. If not, any same estimation for an audio and video recording?4. Has the AC power font been released for it (in which case, the battery life will not be of importance)?Thank you all for any comment. 1. You can select audio only according to the Sony manual. 2. Battery time audio-only is unknown. However, I would go on the Sony claim of 120 minutes of video/audio recording ability. 3. With the supplied battery and optional AC-UD10 power adapter, users can operate and record video while the device is charging. There is a standard 1/4 -20 female tripod mount bushing on the underside of the camera. Can this camcorder take still photos? I am sorry - this music camcorder is optimized for video and cannot shoot still photos. A frame of video could be grabbed from the video time-line during the editing or post production process . Can this camera be used as a webcam for live streaming (example: with ustream.tv??? This camera cannot be used for live streaming. The HDR-MV1 employs built-in Wi-Fi and One Touch NFC (Near Field Communication) to link the camera to a compatible smartphone or tablet. This allows you to instantly upload recorded videos to the Internet. The Wi-Fi/NFC function also turns your mobile device into a remote control and a remote monitor for the HDR-MV1, which is especially useful for framing the scene to achieve your desired shot.